Cambodia Passes Lèse-Majesté Law - Integration Through Media ....! 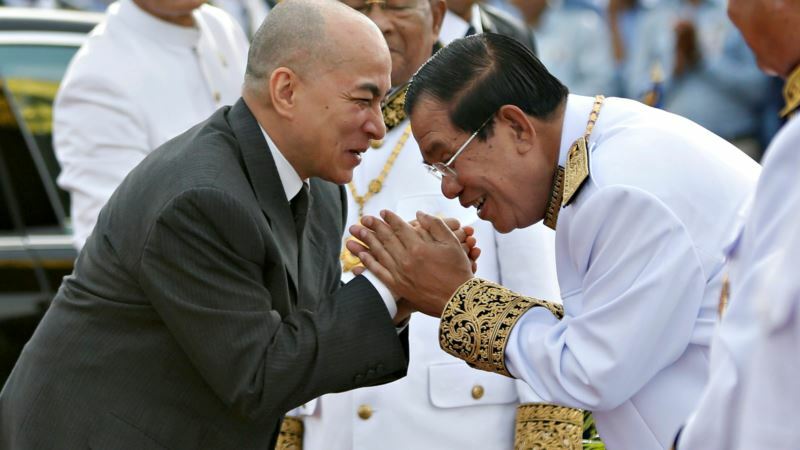 (VOA): Cambodians will now be constitutionally obligated to “defend the motherland” and forbidden from insulting the king under a number of new legislative changes that observers say suggest a prolonged assault on civil liberties in the country. A new lèse-majesté law similar to one in Thailand that observers say has been blatantly and systematically misused to silence political dissent will carry a one- to five-year jail term. It was passed by Cambodia’s National Assembly on Wednesday along with a suite of vague constitutional amendments, among them a change allowing the permanent removal of voting rights for convicted felons. Justice ministry spokesman Chin Malin said the lèse-majesté law was “very necessary” to bring order to the way citizens “exercised their freedoms,” stressing it only applied to insults against the king and not other members of the royal family. “The reason that we did not make it previously and only managed to do it now is that the current context is different with some people irresponsibly exercising their freedom of expression beyond the boundaries that have reached the dignities of the king,” he said. Malin said the constitutional amendments could enable the courts to “confiscate” a felon’s rights to vote and run for office with a possible permanent ban, an adjustment from a prior provision that merely enabled these rights to be withdrawn while the person was incarcerated. “Notably, these obligations are worded so vaguely they could be interpreted capriciously to include a broad range of activities the government may wish to repress,” he wrote in an email. “As such, in addition to infringing on protected freedom of expression, association and so on, they would be inconsistent with one of the key requirements of the rule of law, as properly understood, namely predictability,” he said. Scores of Thais have been convicted of lèse-majesté since the military government came to power in 2014. An insurance salesman was handed a 35 year sentence for Facebook posts deemed insulting to the monarchy. Prominent 85-year-old academic Sulak Sivaraksa, who questioned accounts of a Thai king’s role in an elephant battle more than 400 years ago, and a man who allegedly made sarcastic comments about the late King Bhumibol Adulyadej’s deceased dog are among those who have been targeted using the legislation. In Cambodia, existing defamation, incitement and espionage laws have proved sufficient to target overzealous acts of free expression. Last week, 29-year-old San Rotha was arrested on his wedding day in Cambodia for urging his compatriots to stand up against authoritarianism in a Facebook post. In the same week Thailand deported a Cambodian woman, Sam Sokha, who had been granted U.N. refugee status after she was allegedly filmed throwing her shoes at a poster of ruling party leaders. Opposition leader Kem Sokha, whose party has been dissolved by the courts, remains in jail awaiting trial on a widely derided espionage charge, as do two former Radio Free Asia reporters and an Australian filmmaker. Meanwhile there has been only one notable recent public case in Cambodia related to comments made about King Norodom Sihamoni, extracted from what was supposed to be a private conversation. Former Deputy Prime Minister Lu Lay Sreng fled the country in October after secretly recorded audio was leaked in which he called king Norodom Sihamoni a “castrated chicken” for his reluctance to wade into politics. It would be telling, he said, to see the new European Commission policy toward Cambodia set to be adopted February 26, in light of the continuing trend. “I think that it’s very possible that the Everything But Arms trade preferences that are provided contingent on respect for human rights and labor rights may well be threatened,” he said.